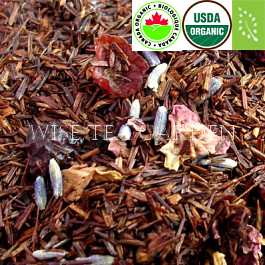 ORGANIC ROMAN PROVENCE © WISE TEA GARDEN® Rooibos (Aspalathus linearis) and Honeybush (Cyclopia Vent. species) are popular indigenous South African herbal teas enjoyed for their taste and aroma. Traditional medicinal uses of Rooibos in South Africa include alleviation of infantile colic, allergies, asthma and dermatological problems, while a decoction of Honeybush was used as a restorative and as an expectorant in chronic catarrh and pulmonary tuberculosis. Enjoyed in South Africa for centuries as a healthy alternative to soft drinks, Rooibos was the first presented to the Western World by a Russian émigré named Benjamin Ginsberg. 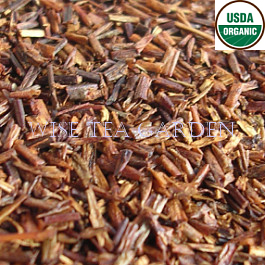 Like Camellia Sinensis (a tea plant), Rooibos is an environmentally sensitive plant. It only grows commercially in one small area of South Africa - Cederberg district. The soil conditions, rainfall and sunshine of this area cannot be duplicated. Having wonderful taste and being caffeine free, Rooibos also has many beneficial properties: It is high in polyphenols (antioxidants), iron, zinc, fluoride, calcium and magnesium. 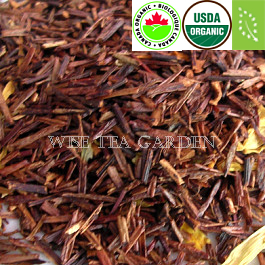 Rooibos tea (Aspalathus linearis) has been used to treat inflammatory disorders in Africa. 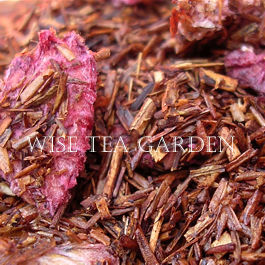 Rooibos means Red Bush in Afrikaans. Steeping Time: Brew Rooibos and Flavoured Rooibos for 5 minutes. Ingredients for Crêpes: 140g organic all-purpose flour (250ml), 37.5ml icing sugar, 1ml salt, 2 organic eggs, 250ml organic milk, 15ml brandy. Ingredients for Rooibos Sauce: 75ml strong Organic or Naturally Flavoured Rooibos, 100g organic sane sugar (125ml), 50ml brandy, organic lemon juice and grated rind of 1 organic lemon, organic orange juice and grated rind of 1 organic orange. Combine all ingredients, stir until sugar has dissolved and leave for at least 30 minutes. Serve with hot crêpes. ULTRA ROOIBOS: Combine 5-10ml Organic Green Pearl Matcha (or 1 perfect matcha spoon) and 30-50ml of hot distilled water, mix vigorously to make a paste-like substance. Top with freshly-brewed Organic Green Rooibos. Enjoy a perfect drinking vitamin-C liquid for a long Canadian winter! In Paris, raspberry jam is most often found spread over butter on a sliced baguette or baked inside a croissant. A Raspberry In Paris Rooibos invokes the mellow flavour of this French treat. Cup Characteristics: Delicate notes of Raspberry come to the fore with light overtones of Rooibos, and a perfect raspberry jam finish. Ingredients: Rooibos, Raspberry pieces, and Natural flavours. Infusion: Reddish orange to full color. Made with all natural flavouring blended with South African grown Rooibos. Cup Characteristics: The cup opens with the fruity notes of rooibos, and finishes with Deliciously Sweet Italian Amaretto aroma and taste. So romantic! Ingredients: Rooibos, Cranberry + Orange + Clove + Almond Pieces, Calendula + Red Cornflower Petals, Cardamom, Anise, Natural flavours, Nut oil (Almond and Hazelnut). Infusion: Reddish orange to full color. Cup Characteristics: Cocoa truffle notes with clean, fruity Rooibos finish. Ingredients: Rooibos, Calendula Petals, Cacao Bean pieces, Natural flavours. Infusion: Reddish orange to full color. Smooth herbal tea made with all natural flavouring blended with South African grown Rooibos. Cup Characteristics: Fruity taste and aroma with mysterious character and subtle, friendly notes of fresh vanilla. 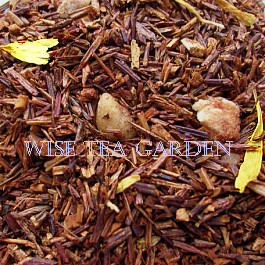 Ingredients: Rooibos, Almond Pieces, Calendula Petals, and Natural flavours. Infusion: Reddish orange to full color. Créme au caramel is a delicious French dessert made of milk, eggs, sugar, and vanilla. Cup Characteristics: Exceptionally smooth with sweet toffee and caramel notes. Ingredients: Rooibos, Calendula Petals, and Natural flavours. Infusion: Bright, highlighted with Calendula petals. Cup Characteristics: Organic Green Rooibos is one of the more recent developments in Rooibos history. Green Rooibos is delightfully aromatic and more delicate than a traditional rooibos. The cup is light in appearance but displays a sweet, hearty herbal flavor with grassy overtones reminiscent of a quality Sencha. Light fruity finish. Ingredients: Luxury organic green rooibos. Infusion: Bright and sunny yellow. Deliciously rich and warm herbal profile of Rooibos meets notes of espresso, yogurt and fruits. Cup Characteristics: The rich taste begins with soft and creamy notes of Kenyan coffee followed by a slightly fruity Amaretto finish. 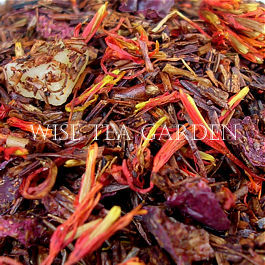 Ingredients: Rooibos, Mango pieces, Safflower petals, Cranberry pieces, and Natural flavours. Infusion: Reddish orange to full color. Made with all natural flavouring blended with South African grown Rooibos. 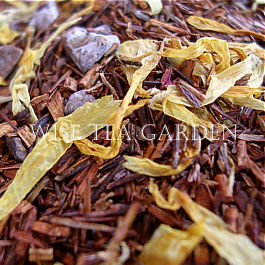 Cup Characteristics: Fruity rooibos medley with aromatic, sweet and unforgettable peach notes. 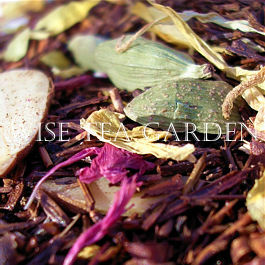 Ingredients: Rooibos, Calendula Petals, Blackberry Leaves, and Natural flavours. Infusion: Reddish orange to full color. The story of Rooibos starts around the turn of the century in South Africa's beautiful Cedarberg region. It was the locals of the area who first discovered that the fine needle like leaves of the wild "Aspalathus Linearis" plant made a tasty aromatic tea. It was they who first harvested the plants, chopped them with axes and bruised them with hammers leaving them to ferment before drying in the sun. 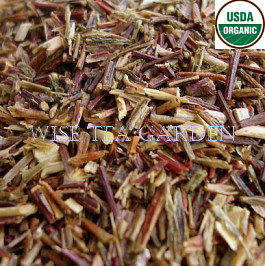 Rooibos is a herb that contains no caffeine. Those that consume Rooibos have claimed that it has a soothing effect on headaches, disturbed sleeping patterns and digestive problems. Cut Rooibos is bound and milled to a uniform length then bruised between rollers to trigger the fermentation process, which results in the characteristic flavor and sweet aroma. Cup Characteristics: Organic and pure with fruity sweet notes. Ingredients: Luxury organic rooibos. Infusion: Reddish orange to full color (depends on brewing time and quantity used). 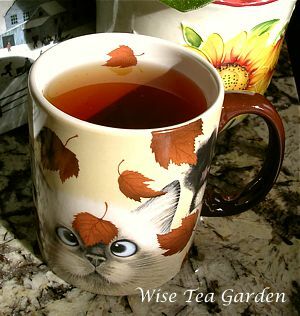 An enchanting herbal tea. Cup Characteristics: Fruity, floral and sweet ripe berry notes with mild lavender finish. Ingredients: Rooibos, Elderberry + Rosehip + Blueberry Pieces, Rose + Lavender Petals, and Natural flavours. Infusion: Reddish orange to full color. Made with all natural flavouring blended with South African grown Rooibos. Cup Characteristics: Outstanding fresh strawberries natural flavor! This truly delightful tea reminds a pick-your-own berry farm in late spring, when strawberries are the most flavourful. 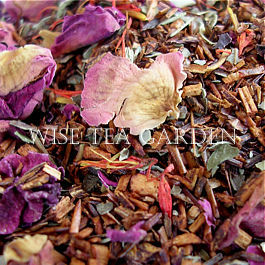 Ingredients: Rooibos, Safflower + Rose Petals, Blackberry Leaves, and Natural flavours. Infusion: Reddish orange to full color. 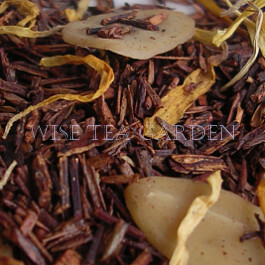 Sweet profile of pear matches the mellow character of a South African Rooibos. Cup Characteristics: Fresh and sweet, ripe Italian pear notes deliciously complement the rich, slightly herbal, Rooibos finish. Ingredients: Rooibos, Apple and Pear pieces, and Natural flavours. Infusion: Reddish orange to full color. Antioxidant Level: Low (Rooibos does not contain Epigallocatechin Gallate - a Camellia Sinensis (Tea) polyphenol), Caffeine Content: Caffeine Free Herb. Grade: Fine Matcha 10-16 micron. Made to Japanese specifications. Growing Altitudes: 1500-2500 feet above sea level. Manufacture Type: Traditional Matcha process, small batch crafted, 100% Natural. Cup Characteristics: Smooth with bitter chocolate notes. Infusion: Burnt orange. 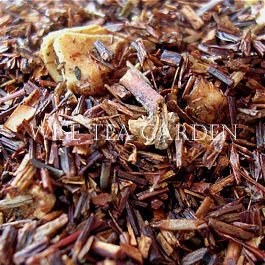 Luxury Ingredients: Organic Rooibos. FYI: According to the South African Rooibos council, by that time, the plant had captured the attention of a noted medical doctor named Dr. Le Fras Nortier. He began researching Rooibos' medicinal value and studying its feasibility as an agricultural crop. Thankfully, his research and innovative outlook paid off, and Rooibos began life as a commercial crop in the 1930s. By 1984, Rooibos tea was making news in Japan where natural health practitioners believed it had anti-aging properties.